When Molly Mullet's husband dies from a gunshot wound inflicted right before her eyes, she abandons her work as a high school chemistry teacher and joins the police force. Now she faces another crossroad in her life. She follows a trail of blood into the closet of Solms Hall, an historic music hall in the Hill Country of Texas. Inside lay the bloodied body of Rodney Faver, band manager for Trenton Wolfe, the hottest new star in country music. Faver - sprawled across boxes with a guitar string embedded in his neck - had along list of band members, song writers, ex-wives and other associates who wanted him dead. But the chief suspect is Molly's childhood friend and Solms Hall janitor, Bobby Wiggins. He is arrested and wrongfully charged with the gory murder. Molly embarks on a mission to free Bobby from jail and track down the real killer. Or will he find her first? The long list of eccentric suspects shortens as a psychopath picks them off one by one. Will Molly uncover his identity before she becomes his next victim? 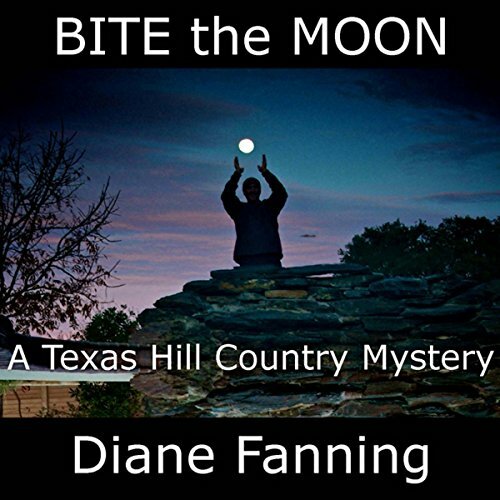 Careen through the hills of Texas with Molly Mullet in a race against time as she seeks justice and courts death in Bite the Moon, a suspense-filled journey by Edgar Award nominated true crime writer Diane Fanning. Would you try another book from Diane Fanning and/or Flora Plumb? Could you see Bite the Moon being made into a movie or a TV series? Who should the stars be? Yes but the hero must not be so lacking in insight. An excellent plot with lots of potential, but why is the heroine frequently so plane stupid. eg what sort of a detective would invite a known murderer to her house and refuse backup, or march unarmed outside when she suspects the baddies are in the garden. She is lucky she has friends in the police force. The patient rush out of hospital was far fetched and could have been handled differently. Try again. A woman does not have to be a Jack Reacher type, but she can be very effective by using her brains.